In a timely column from the excellent American Greatness website titled, “Media Gorges Itself on Hatred While Ignoring Atrocities,” Pedro Gonzales writes about mass bloodshed you’ve probably not heard much about - the continual massacre of dozens upon dozens of Christians in Nigeria by Muslims. In March alone, two villages saw 100 houses burned and 81 Christians slaughtered, and that’s just the tip of the bloody iceberg. What the media HAS gorged itself upon lately, of course, has been the horrific attack on New Zealand’s Muslim community by an avowed white supremacist scumbag who won’t be named in this column. Big news? Obviously, but if you ignore the political motives behind the media’s choice of blanket coverage and outrage, you’re missing the point entirely. That’s because there’s an agenda behind what our ‘moral betters’ choose to cover and how long they choose to cover it. Except, it’s just not true. With Friday’s attack being a glaring, tragic, and highly covered exception, minority communities are generally far safer in majority-white countries than they would have ever been in their homelands. Muslims, in particular, are far safer in Europe and America than Christians of any race would be in a majority-Muslim country. Yes, everyone with a soul should grieve with the victims in New Zealand and condemn the violence and the hatred that spawned it, but aren’t we letting the politically motivated shooter win when we attempt to silence and ban relevant political speech around key issues such as this? The fact that a truth is politically incorrect doesn’t make it any less true, and the truth of the above statements begs a ginormous question we aren’t ‘allowed’ to ask in today’s absurd, politically-correct driven age where simply making obviously-true observations can ruin reputations and end careers - Are there drawbacks to unlimited Third World, particularly Muslim, immigration to Western countries? OK granted, maybe the day of an attack on Muslims isn’t the day to ask that question. 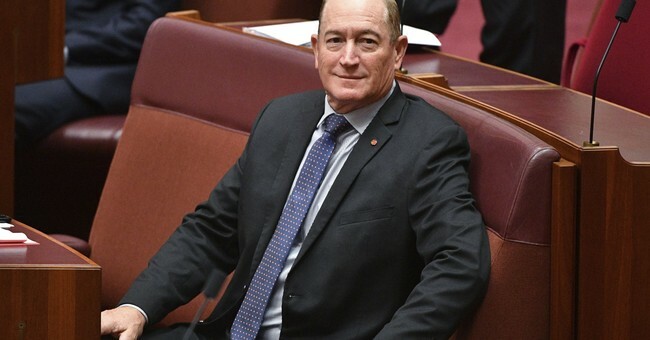 Just ask Australian Senator Fraser Anning, the latest target of the media’s “Two Minutes Hate.” If you frequent news or get on Twitter at all, you may not have heard about the massacres against Christians, but you definitely heard about Anning’s statement, the one where he seemingly blamed the attacks on Muslims. Even though he began his statement by saying he was “utterly opposed to any form of violence within our community" and "totally" condemned the shooter’s actions, Anning has been condemned by virtually everyone from Australia’s prime minister to Winnie the Pooh for seeming to blame the attack, not on the shooter, but on New Zealand’s Muslim community. To be fair, the Australian senator is far from blameless here. Saying Muslims themselves are not “blameless” after an attack on their community is the equivalent to blaming Christians for getting slaughtered in Nigeria, and it just doesn’t help. But as they condemn Anning, the powers that be intend for you to ignore the other parts of his statement. “Controversial yes, and I don’t agree with every word, but many of his points on immigration are valid and need to be considered in the larger conversation,” tweeted Newsmax host John Cardillo along with a screenshot of Anning’s statement. Cardillo certainly has a point. Read Anning’s statement for yourself and try to curb the brainwashing-induced knee-jerk we’re all victims of to one degree or another. Are there parts that ring true? Research it out and decide for yourself. Sure, Anning did us no favors with the timing of his words and the inflammatory nature of some of them, but in his own clumsy way he is pointing out valid issues that should be, but sadly won’t be, discussed reasonably between well-meaning people. Indeed, the vast majority of Muslims are law-abiding, great people even, and should be treated with respect as individuals created in God’s image. But given immigration and birth rates, how soon does, say, a 30.6 projected Muslim population percentage in Sweden in 2050 turn into 50.1 percent and a Muslim majority country? What then are the ramifications for the country’s non-Muslim population? Historically, does strife occur when large groups of Muslims and Christians exist in the same country? Do the citizens of a country have a right to determine who is let into that country and in what numbers? These are hard questions, but they need to be asked, and answered. Because as history proves, Christians and even non-Muslims often do not fare all that well in majority-Muslim countries.